With the Iveco and the Kung box we started our planned trip to the Baltic states (and more) as planned. For our first night we followed the recommendation of some friends at ALG and stayed near Northeim. There is a bit of noise from the A7 but the place is definitely worth to be recommended. 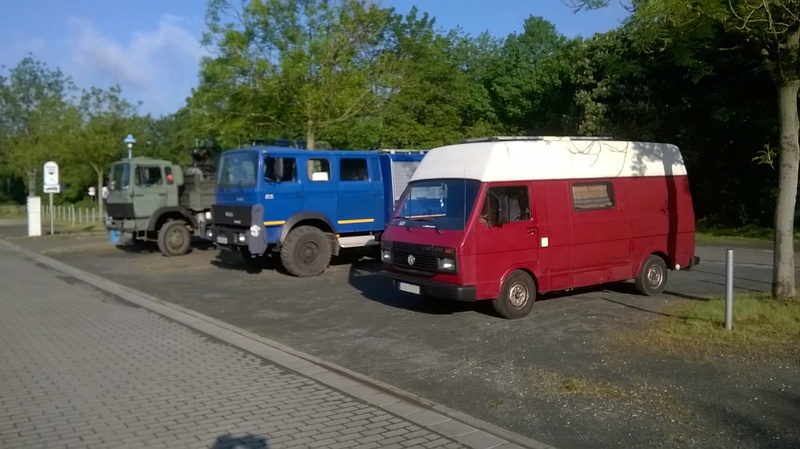 On the next morning we saw that a VW LT had also joined, we had already met that couple a while ago when they where travelling with their Hanomag. Planmäßig sind wir auf unsere Reise ins Baltikum (mit Erweiterung) gestartet und haben für die erst Übernachtung den empfohlenen Platz in Northeim am Northeimer See genutzt. Man hört – wie angekündigt – die A7, der Platz ist aber definitiv empfehlenswert.